Our little Felix was flagged as potentially having Marfan Syndrome at our 24-hour post-partum check-up. Neither my husband or I have Marfan syndrome, but Felix had characteristic Marfan hands and feet, and was extremely tall and thin, he was 8lbs 10 oz without any baby fat. The doctor told us that we likely wouldn’t know anything for sure until he was a teenager. However, they were wrong about that. When Felix was 8 weeks old, he had his first appointment with his pediatrician. Felix woke up that day screaming, and he was extremely pale. His pediatrician put the stethoscope on Felix’s chest, and instructed that an ambulance be called immediately. They explained that Felix’s heart rate was extremely rapid, at around 230 bpm. Felix went into SVT (Supraventricular Techycardia). His heart had found an extra electrical pathway, and was in effect short circuiting itself. We were rushed to the Alberta Children’s Hospital and they attempted several times to break him out of SVT using intravenous medication. Nothing was working! It was a terrifying afternoon, we weren’t certain if we were going to be getting out of there with our baby. After about 6 hours, several failed IV’s and a lot of parental anxiety, a cardiologist who specializes in electrical issues came on shift. Dr. Clegg calmly assessed the situation and tapped the back of Felix’s heart with a mild electrical signal to reset the irregular rhythm. There are no words to express how relieved and thankful we were. What does SVT have to do with Marfan syndrome? Well not much really. But what it did do is fast track Felix’s diagnosis. In that initial week in hospital Felix had multiple echoes, and met with cardiologists, geneticists and other specialists. We learnt that our 2 month old baby already had an enlarged aortic root and had moderate to severe mitral valve prolapse. The cardiologist felt it was extremely likely that he had Marfan syndrome or a related disorder. He was started on a beta blocker and Losartan. By three months Felix had an official genetic diagnosis, and soon after it was confirmed as a spontaneous FBN1 gene mutation. Wrapping our heads around having a baby with Marfan Syndrome has been a roller coaster. There are days when we are strong and resilient, and there are days when we feel angry and short-changed. There are days when you feel like you’re a MD in training, and then there are days when you feel so clueless and uninformed. And then sometimes you google something and send yourself into a complete panic. If I can offer any advice to parents with young children with Marfan syndrome, it is to NEVER look at the historical information on Neonatal Marfan syndrome. Genetics and medical research are changing the management and treatment approaches of infants with neonatal Marfan syndrome. We must keep looking forward to a future these kids will enjoy. From three months on, Felix has been on a steady treadmill of appointments. He got glasses, had hernia surgery and met with countless specialists. Every 6 weeks we went for another echo. We alternated between good news (his aorta is stable) and bad news (his aorta has grown by 3 mm). By 10 months of age, in late January 2017, our cardiologist recommended presenting his case to a conference of surgeons to determine if we should proceed with surgery. After months of waiting, Felix had a heart surgery on June 21, 2017. In 7.5 hours, his aortic root was replaced while sparing his aortic valve. Both his mitral valve and tricuspid valve were repaired. At first recovery seemed extremely slow, but once Felix was moved out of the PCICU, and especially once his feeding tube was removed he started making huge strides. At 7-days post-surgery he was out of there, waving bye to every person he saw along the way! Writing this, we are now 4 months post-surgery. The outcome of Felix’s surgery has been extremely successful. Prior to surgery we didn’t think he was symptomatic, but we have been blown away by the difference in his energy levels. With the help of physio, he just recently started walking. 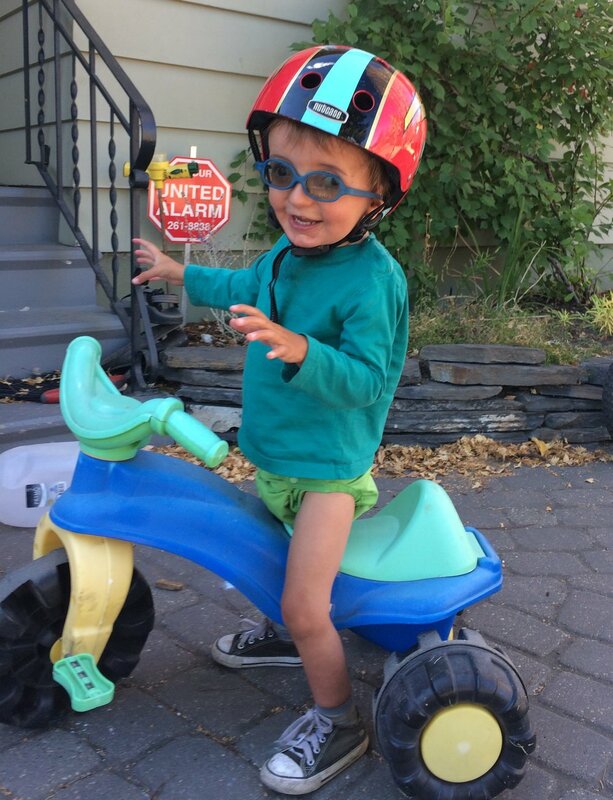 He loves riding bikes, dancing, camping, and teasing his sister. He wakes up singing, talks non-stop, and is the most positive, fun-loving, and resilient individual that I have ever had the pleasure of knowing. Yes, he will require another heart surgery eventually, but right now with regular monitoring he gets to go on with the business of being a toddler. Now when we go to the cardiologist it feels like we are visiting family. Everyone at the clinic knows Felix and genuinely cares about how he is doing. We feel extremely fortunate to receive such care. With Marfan syndrome we really don’t know what is going to happen next. But right now, the worst is not imminent, and the future is hopeful, for that we are grateful. We are building a small network in Calgary, as well as through the online community. While we have rough days and weeks, we try to focus on what we do have, and what is truly amazing about our lives and our little family. Having a child like Felix is incredible!